Enjoy the best inspirational, motivational, positive, funny and famous quotes by Alfred Worden. Use words and picture quotations to push forward and inspire you keep going in life! 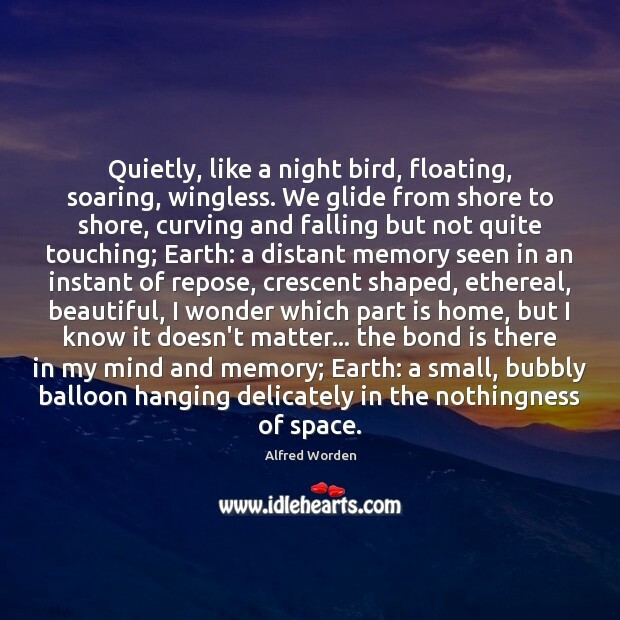 Quietly, like a night bird, floating, soaring, wingless. We glide from shore to shore, curving and falling but not quite touching; Earth: a distant memory seen in an instant of repose, crescent shaped, ethereal, beautiful, I wonder which part is home, but I know it doesn't matter... the bond is there in my mind and memory; Earth: a small, bubbly balloon hanging delicately in the nothingness of space.